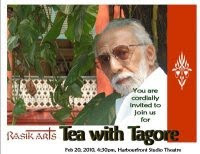 Tea with Tagore in Toronto. I’m happy to report that there were more people interested in the presentation than there were seats at Harbourfront’s Studio Theater. Ishwar Mooljee played Tagore. His resemblance to the master of letters is uncanny. He effortlessly engaged the audience with his conversational approach to the subject. Sally Jones’ research on Rabindranath Tagore as a painter was unobtrusive. The wonderful world of Tagore as an artiste remains incidental in relation to his enormous reputation as a writer and justifiably so. Many outside the subcontinent may not know this, but Tagore is the only poet who has written the national anthems of two nations – India and Bangladesh. I would liked to know whether Tagore’s nephew Abanindranath Tagore had any influence on him as a painter because Abanindranath’s is credited with the formation of the first truly Indian - Swadeshi - style in painting and his students included stalwarts such as Nandalal Bose and Jamini Roy. While this could have provided an added dimension to the program, on its own Tea with Tagore was riveting, although just half-an-hour was rather too short. I waited to meet her after the show, but couldn’t. She was probably backstage busy wrapping up.